Belhaven | Beer Apprentice - Craft Beer News, Reviews, Interviews and Info. 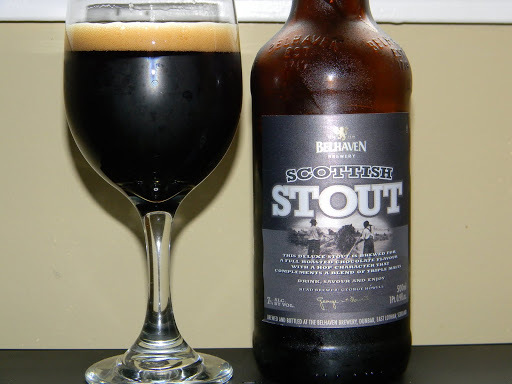 Tonight, I would like to bestow on you my experience drinking the Belhaven Scottish Stout. It is produced by the Bellhaven Brewery near Dunbar, Scotland. From the website, belhaven.co.uk, I found this quaint statement. I’m ready for a glass!!! This Stout was 7.0% ABV and poured from a 16.9oz. bottle. This beer has a very dark brown, almost black appearance with small traces of ruby around the bottom of the glass. The head was of a lighter tan variety, smooth and creamy looking with nice size and good retention. In the aroma I found that a substantial amount of dark fruit was present. Something along the lines of dark grape/prune and raisins. A noticeable hint of booze, but it was mild and was hidden well by some bittersweet chocolate. The chocolate was considerable, however I thought it might be a touch more robust. In the very back, I noticed notes of oats or something. Not bad. Balanced pretty well actually. The taste was a mixture of the dark fruit and the chocolate. Much like the aroma, the chocolate was not as plentiful as what I had prepared myself for. A satisfying, creamy flavor helped add to the complexity and round out the overall taste. There wasn’t much bitterness or alcohol in the mouth, but that’s ok. None was really needed. The mouthfeel was medium, smooth, slick and mostly creamy. It didn’t leave a tremendous amount on the palate, but it did leave a little bit. It wasn’t really dry, however it wasn’t really watery either. It sits right in the middle. This is a pretty good brew in my opinion. Not the best or most robust Stout that I have ever tried, but well made and it made for an easy, enjoyable drink. This Scottish Stout could almost be a session beer under the right conditions and wouldn’t be a bad choice to pick up if you happen to see it. Score: 4.0 out of 5.